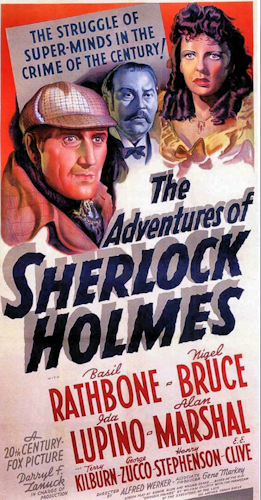 Second of the Sherlock Holmes films with Basil Rathbone the film was the last of the period dramas and the last before the series moved to Universal for another 12 features. and altering Rathbone's career forever. Solid mystery is good enough to make you wonder how, if at all, the two mysteries (murder and Moriarty are related). They are of course and getting to that point is a great deal of fun. Its clear from this film why the series continued on from this point. 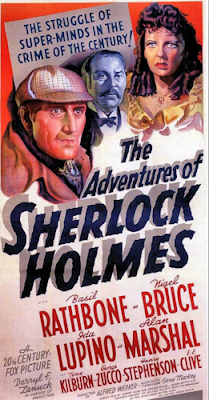 With Rathbone firmly front and center (he was almost a minor character in HOUND OF THE BASKERVILLES) Holmes is seen to be instantly iconic. Its also clear why it would consume Rathbone since with rare exception no actor has ever been this identified with a character- even by people who are not fans of the series. Even if the film wasn't historic in giving us the person who until recently was THE Sherlock Holmes (many now argue that Benedict Cumberbatch is not the Holmes), the film would be recommended as a damn fine mystery.